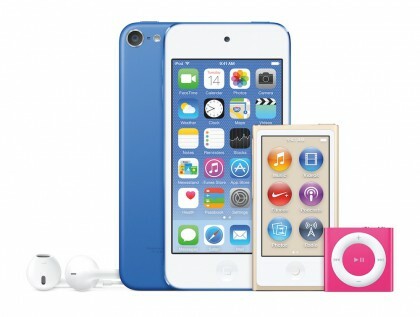 Apple on Wednesday updated its iconic iPods with new colors and a host of new features for the iPod touch. Apple went all out with the iPod touch, giving the device the A8 chip, the same one used in the iPhone 6. Apple told me yesterday that the CPU in the new touch is six times faster than its predecessor and 10 times faster in graphics performance. With its 4-inch display, iPod touch also gains support for Metal, which gives it even more options to run powerful games. The touch also has the M8 motion co-processor, which tracks movement and other data for health and fitness apps. Apple also made some significant changes to the cameras in the iPod touch. In addition to an 8 Megapixel camera, Apple updated the image sensor processor and added burst and slo-mo modes to the iPod touch. Not to be outdone by the iPhone when capturing movies, the iPod touch also gains cinematic video stabilization. This is especially handy if you’re capturing a movie while moving—the technology stabilizes the movie automatically. The front camera of the iPod touch remains at the same resolution, but it also has an updated sensor and gains burst mode. That should be good for some new selfies. One other change I’m glad to see is upgraded Wi-Fi—the iPod touch now supports the faster “AC” standard. The new iPod touch will come in space gray, silver, gold, pink, red, and blue and costs $199 for the 16GB model, $249 for 32GB and $299 for 64GB. For the first time the iPod touch comes in a 128GB model for $399. Apple told me yesterday that the iPod nano and shuffle models will maintain their current design, price and specs, but will come in the same new colors offered for the iPod touch. Apple said that the iPod is still popular among all age groups and for many, it’s their first product in the Apple family. I have many iPods and I’m so glad to see Apple upgrading them for new, and old, users.